We all have our personal reasons for wanting to know who viewed our social media profile picture or status. Today on electronics you will learn how to see who viewed your new 24 hour status on WhatsApp. The temporary status is one of the new features added by WhatsApp to their application. With the new temporary status, you can share with your contact photos and videos of what you are doing at anytime of the day. You can share videos, photos, and GIF files. And the privacy feature allows you to control who sees your 24 hour status. You can make your 24 hour status visible to only one person or a group of contacts you select. That way, you can share photos and videos with just family and friends or make it accessible to all your contacts. But after updating your status, you might want to know if someone you directed the message - your video or image - on the status to has actually viewed it. We still have other reason for wanting to know who viewed our status though. 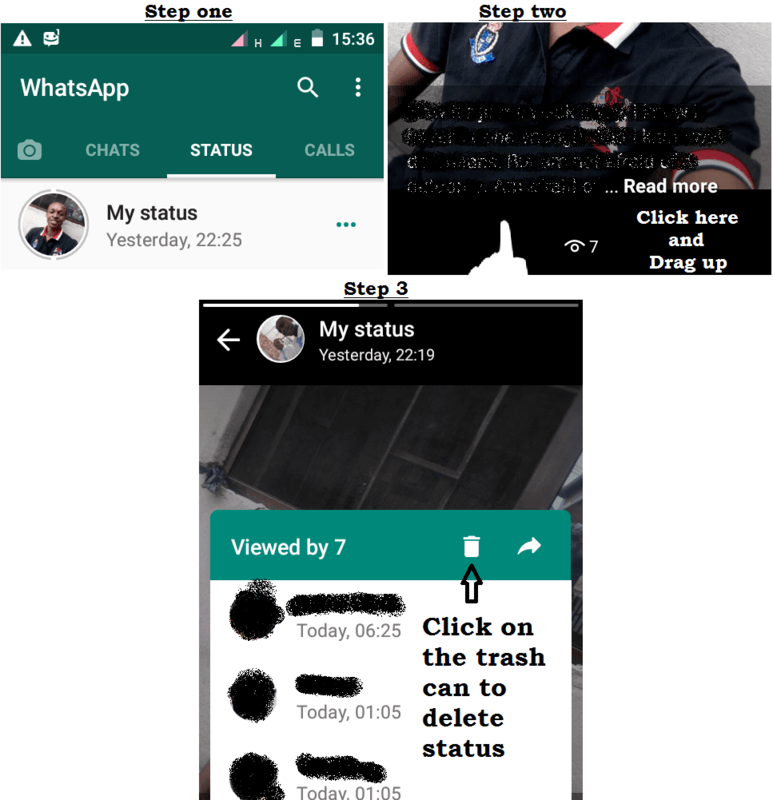 Let’s see how you can view the contacts that really opened – viewed – your new WhatsApp status. Let’s assume you updated your status few hours ago and now you want to see contacts who opened it. Just follow the steps on the picture below. Step two: Open the status you updated; click at the bottom where you have the counter and drag it up. Step 3: Those are the contacts who viewed your profile. You can also delete your status by clicking on the trash can icon as shown in the image. That was simple enough right? Now you can see who viewed your status and you can also make it unavailable to certain people on your list.